As an American I have thought for a very long time that American military resources should be in America. How about on that tricky border with Mexico? How about in the parts of the U.S., and that’s nearly all, where there is serious gang activity? How about dealing with the war on drugs? Right in the channel that I can see from my porch here in Tortola, you can see the go fast boats picking up whatever fell out of a plane that just went over, in broad day light. Right now all the U.S. has dealing with that is one Coast Guard cutter. Men, women and children died about two years ago on a go fast that was supposed to take them to St. Thomas and in the chase back through here by the coast guard they ended up on a reef. Right now we are feeding and housing the captain and his mate from that ONE event, we buried all the dead and had to repatriate the survivors. That’s one little government paying for one incident and that happens out here all the time. The U.S. government charters flights out of the U.S. every day to fly illegal aliens back to where they came from and I hear that when they get off the flights some Immigration and Customs Enforcement (ICE) agents tell them, “See you soon”. Canadian photographer Paul Watson captured the images of U.S. Staff Sgt. 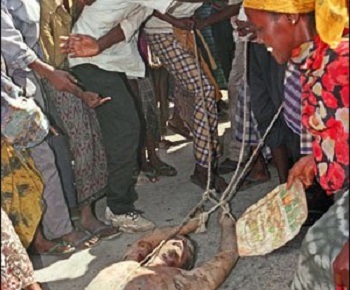 William David Cleveland being dragged through the streets of Mogadishu in 1993. I think we have a big enough fowl coop in America, including its territories, to keep in order and/or clean up. Out here where I live we could use some help from the UK to fight the war on drugs because the only way we have of even curbing it is to keep the guys who are caught in jail for as long as possible while we wage protracted legal battles with QCs (Queen’s Counsels) who are far more clever than the legal staff we employ to go up against them. I only went to one funeral at Arlington National Cemetery, but it was enough. Once you see those tombstones, which represent the lives lost to war, you’d have to think even for a moment, if we are going to make that level of human sacrifice for war, then they should have been lost in America fighting for America, keeping it safe. I am certain someone will correct me if I’m wrong. The US is involved in fighting wars that started for religious reasons. Most of the people fighting them have in some respects forgotten why they are being fought. Seven year olds are being shot, wounded, killed in horrible ways over a war they didn’t start. That’s all most of the young people who were born into these wars know and they probably don’t know why exactly they are hating the people shooting at them other than that they are shooting at them. America cannot affect religious wars, it’s not our war, we don’t even understand in most cases that level of zealousness (for want of a better word). When people in Somalia were starving, the US did not intervene. I remember asking a partner at Arthur Andersen how America could allow that to happen and he said that was because they don’t have anything we need, no oil, minerals, etc. Then America went over there and I can never forget seeing on the news the body of an American soldier being dragged from the back of jeeps through the streets by the crazy, grinning guys with guns. So America was screamed at by the rest of the world for doing nothing about little children starving with flies all over them, they went to carry food which was then stolen by the rebels, so the children were still starving; then they were brutally killed and dragged around for fun. Any of those soldiers could have been my son–and that was during the time I lived in DC where every day there were drug wars raging all over the city and young men were dying. I remember having a conversation with a retired general about America taking care of the problems within it’s borders and he argued with me about the merit of that. He died from cancer and I went to his funeral and seeing those head stones only convinced me more that America needs to stay in America and deal with its own social and political problems.